Incredibly moist and lightly spiced cake smothered in smooth cream cheese frosting. These Pumpkin Cake Bars with Cream Cheese Frosting are absolutely delicious. If you haven’t tried pumpkin cake before, imagine carrot cake but slightly different. I realise that isn’t helpful but this recipe has the familiar flavourings of cinnamon and the moistness of carrot cake, but the pumpkin provides something slightly different. I hadn’t tried pumpkin until an American friend I used to work with brought in pumpkin bars for Thanksgiving. I’d never had anything like them, they had such a unique taste and of course because it’s an American recipe they had a lovely cinnamon flavour. Becky was kind enough to give me the recipe so I could make them myself. 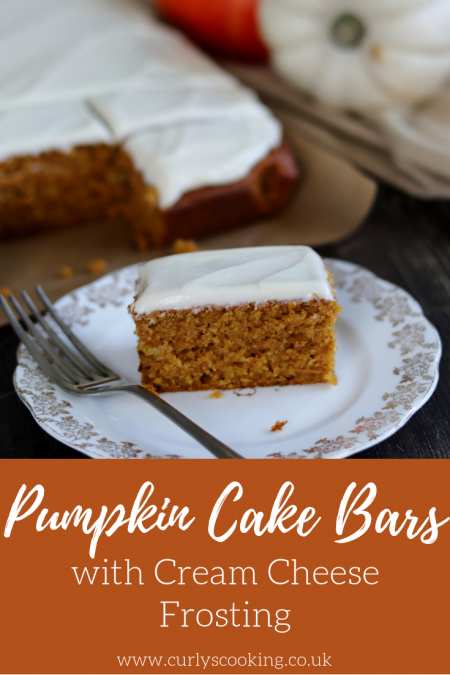 Over the years I have made small changes to the recipe to hopefully make these Pumpkin Cake Bars with Cream Cheese Frosting even tastier. These hands down Mr Curly’s favourite thing I have ever baked. 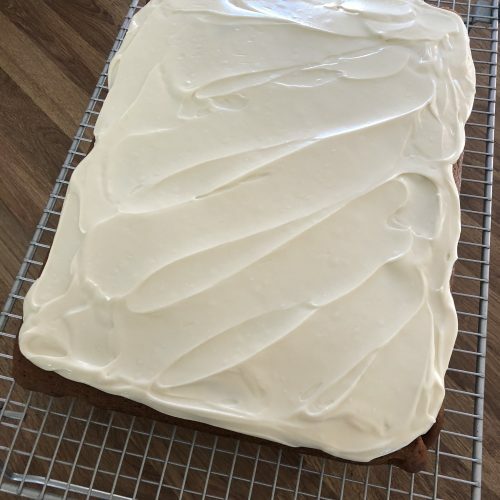 He loves carrot cake but he really loves these Pumpkin Cake Bars with Cream Cheese Frosting and would like me to make them more than the once a year I do. 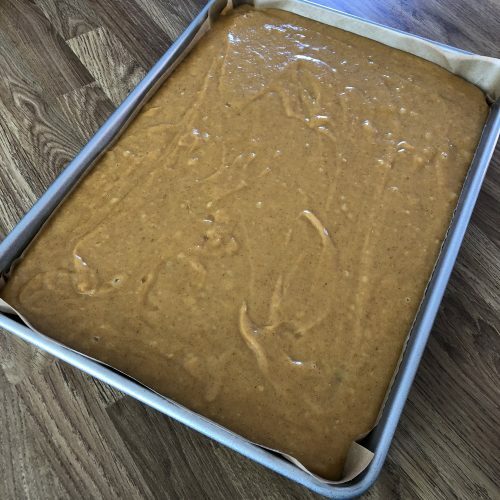 When I’ve mentioned the Pumpkin Cake Bars with Cream Cheese Frosting before people automatically assume I spend hours preparing the pumpkin from scratch.But the recipe uses pumpkin puree from a tin so it really couldn’t be easier. Libby’s pumpkin puree was recommended to me to be the best to use because it is what American’s use. You can’t get it in every shop so you might have to look around for it. I think Waitrose stock it all year, I have seen it very occasionally in Aldi and I found it the last time in the ethnic food isle in Tesco. It keeps for years so you can always buy a few when you find it. You could always make your own pumpkin puree if you would like. When I have made my own in the past it has been wetter than the shop bought puree. I would recommend draining the pumpkin thoroughly in a sieve before adding it to your cake mix. When Mr Curly has taken my Carrot Cupcakes with Cream Cheese Frosting into work before, his colleagues were surprised that they actually had carrot in them. They then gave me the challenge to see if I could bake with other vegetables and for it to taste good. I knew Mr Curly loved these bars and they were a tested recipe so I decided to make these. No one guessed that they were pumpkin bars but everyone thought they were delicious. I think I passed their test! Becky’s original recipe was in cup measurements as this is the most widely used measurements in America. For years I kept the recipe like this, but I finally took the plunge to convert the recipe to grams. This may sound like an easy thing to do, but I find cup measurements to temperamental and even if you measure correctly, I don’t seem to get any two cups weighing exactly the same. So this year, Mr Curly was my sous chef and he made the cake as I was converting the ingredients. I hope this makes the recipe easier to follow for everyone and creates consistent measuring. Not only did I update the recipe this year, I also updated the photographs. The only photos were by no means the worst on my blog, but they definitely needed a revamp! My cake took 36 minutes to cook. Check yours after 30 minutes to see if it is cooked. You don't want the cocktail stick to come out completely clean, a few sticky crumbs are fine because this is quite a moist cake. Nutritional information is given as a guide only. 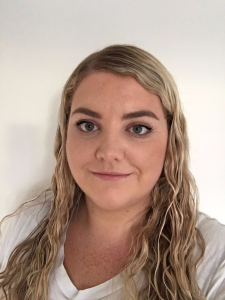 This entry was posted in Biscuits, Cookies and Traybakes on April 15, 2014 by Curly. 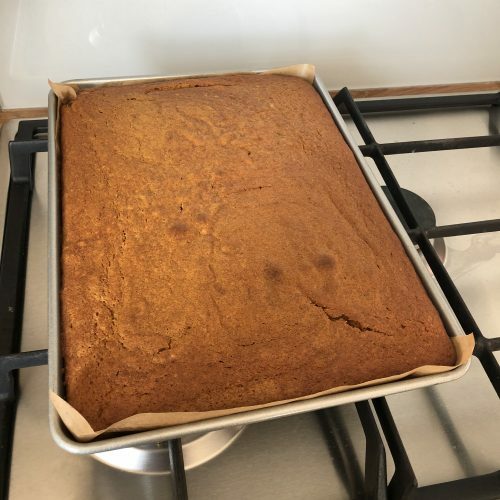 Yum, I love pumpkin cake and your recipe with the frosting sounds perfect – definitely a must try. Your pumpkin bars look delicious. I assumed it was gingerbread when I first looked. That would have been good too, but pumpkin is definitely the veg of the moment. Love anything pumpkin at this time of the year! These bars look so tasty, not to mention that heavenly cream cheese frosting on top! I can almost taste it! It looks delicious! I think pumpkin puree is great in cakes but that’s probably mainly because I just love the spices it goes with! Oh yes, the spices make it! The frosting looks so delicious and I’ll bet just brings this cake to perfection. Thanks Jenny 🙂 Ooh cinnamon is just delicious isn’t it! The texture of this cake looks fantastic and using cinnamon instead of pumpkin spice makes a pleasant change. I’m a huge pumpkin fan and it’s perfect for baking! This cake looks absolutely delicious – I would prefer this to carrot cake any day of the week! It’s so delicious and makes cakes so moist doesn’t it! Im obsessed with pumpkins this time around. The cake looks super moist and delicious. And with that icing, I can almost taste it. So tempting and mouthwatering. It looks very moist and it must be delicious too.